If you’ve been eagerly waiting for the CD release of Album 59, Taking the Plunge, you might be wondering what the new album will look like up against your existing Adventures in Odyssey collection. Today we’re unveiling the final front cover, as well as the back of the package design. Adventures in Odyssey albums will be released twice a year as we move forward. Twelve audio series episodes will be released each year as 6-episode albums instead of 12 (or more) as in the past. 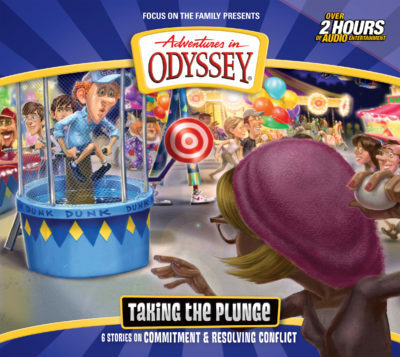 Meanwhile, you can also hear 12 addition episodes via the Odyssey Adventure Club (episodes released once a month). In essence, 24 episodes are still in production each year as has been the norm for the show. No matter what the AIO packaging looks like, whether it contains four CDs or two, it’ll always be the same show with high-quality acting and sound design. Formats and production costs may change, but the same award-winning team works hard to produce a show that impacts families and meets them right where they are. 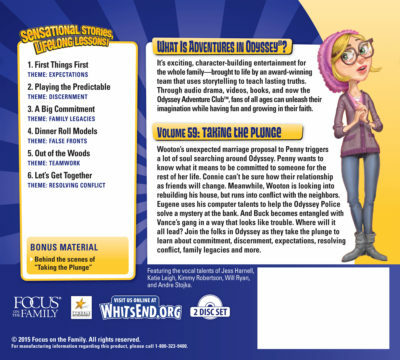 Be on the lookout for your CD copy of Taking the Plunge this August! Exciting things are on the way. Visit our product page to learn more about this audio release.